I made this side dish couple of weeks back. My girls hate eating paneer, but luckily they liked this side dish. I made this as a very rich and creamy side dish. Here goes the recipe. Thaw the green peas. Chop tomato and onion. Now take the chopped tomato, onion, cashew, green chillies, coconut, clove, cardamom, coriander seeds and grind it into fine paste. Pre heat a teaspoon on ghee in a pan, fry paneer pieces to golden brown and keep it aside. In the same pan, preheat remaining ghee, splutter cumin seeds to golden brown, add the grounded masala paste to it. Add 1/4 cup of water, turmeric powder, salt and red chillies powder and let it boil. 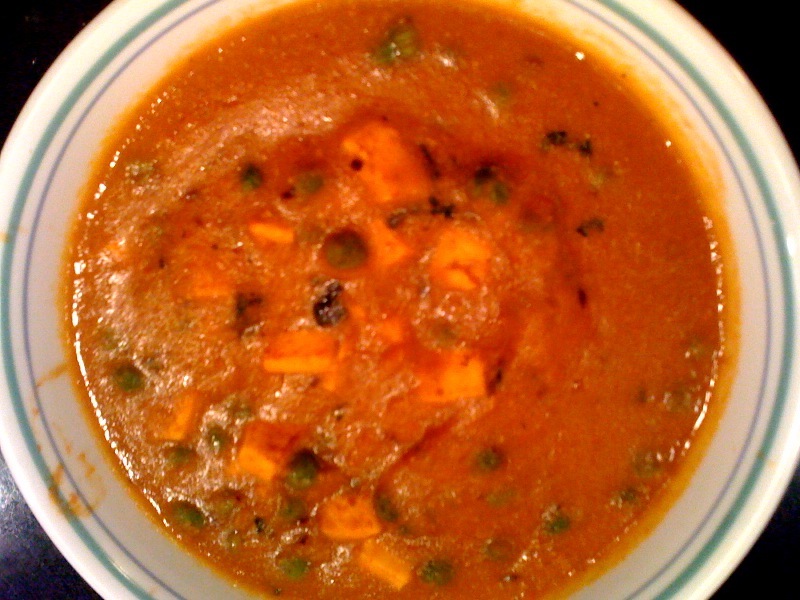 When the raw smell goes, add the fried paneer pieces along with the green peas and let it cook for another 3 minutes. Now add the whole milk and yogurt and let it bil for 5 to 7 minutes. Adjust water according to the required consistency. Add the finely chopped coriander leaves and enjoy it with hot chapathi/poori.